On a trip to see Julie's house, a major work by Grayson Perry, we noted a rather fine village station at Wrabness, the rail stop for the artwork-which-you-can stay-in. Walking through the fields around the house, we eventually came upon this excellent use of multiple enamelled metal advertisements on a garage roof near to the edge of the village. Dating to 1881, Wincarnis (which is derived from wine-'carnis': the Latin word for 'of meat') is a brand name of a British tonic wine, popular in Jamaica and some other former British colonies. It is a fortified wine (17%) now made to a secret recipe of grape juice, malt extracts, herbs and spices. It tastes a bit like sweet sherry. Originally Wincarnis was produced by the Norwich mustard producer, Colman & Co. It was originally called Liebig's Extract of Meat and Malt Wine. No, really. The brand was eventually owned by Hedges & Butler (part of Bass), which was acquired in 1998 by Ian Macleod Distillers Ltd of Broxburn, Scotland. 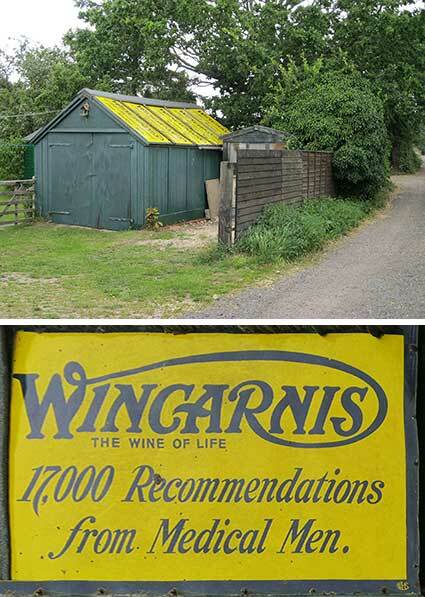 Wincarnis is currently made by Broadland Wineries in Norfolk, and sold by Macleod. It no longer contains meat. 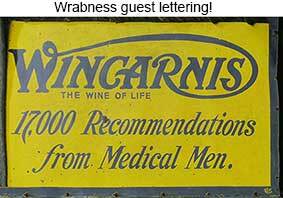 It is not specified how they counted the recommendations of Wincarnis ('The Wine Of Life') from 17,000 different Medical Men or 17,000 recommendations by two Medical Men, but we're sure that these were all glowing and reliably authenticated. The only remaining question is: where did the owner get such a large number of enamel Wincarnis advertisement signs? Ten are visible.